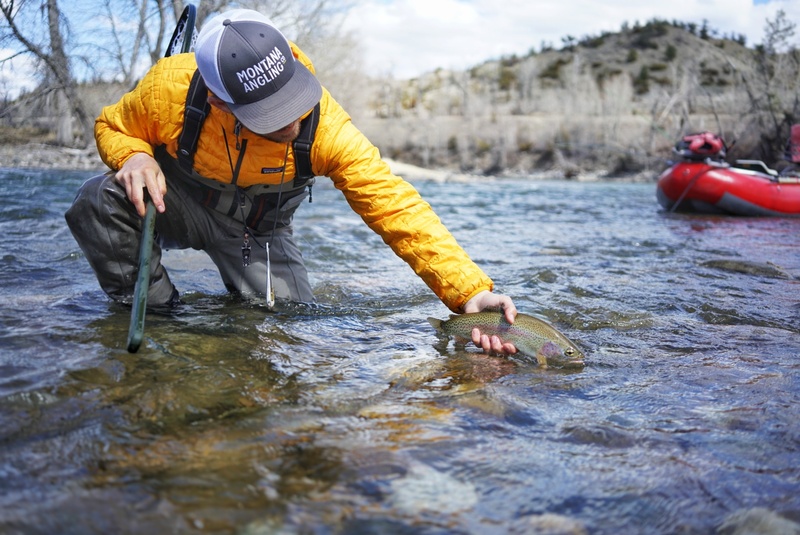 As another great season of guided fly fishing trips in Montana starts to wind down we are starting to look ahead at the 2019 Montana fly fishing season. Bookings have started to roll in and calendars are already starting to fill up. It is too early to make any predictions for what the 2019 season will hold for anglers but you can bet our Montana fly fishing guides will be ready to go once the snow melts, and many well before. We will be spending the Winter building Lodging and Fishing package options for anglers looking to fly fish multiple days and stay at the finest lodging, Check back on our website to learn more. Interested in fly fishing in Montana November through April? Take advantage of our special Winter and Spring guide trip rate of $400. Same great guiding, same great blue ribbon rivers, for one great deal. April fly fishing on the Missouri River, Madison River, Yellowstone River, and Paradise Valley Spring Creeks can be as good as it gets. Get it while the getting is good! Check us out on YouTube for fly tying demos of our favorite fly patterns. Continue to check back on our blog for all sorts of great articles about fly fishing in Montana. Reviews, how-to's, and more great info. Learn about fly fishing in Montana from the best source: the outfitters and guides on the water every day. Full on winter fly fishing. Need a day off from skiing and want to get a line wet with our professional Bozeman fly fishing guides? Give us a shout and we’ll get you on the water. Paradise Valley Spring Creeks and the Madison River will be great options. Some of the best fly fishing of the year in Montana, especially if cooler temps don’t bother you. Take advantage of Spring guide trip special rates. BWO and midge hatches daily. All of our blue ribbon rivers will be fishing well. Fly fishing options include: the Yellowstone River, Madison River, Missouri River, Paradise Valley Spring Creeks, Gallatin River, and Jefferson River. Expect to find our Montana fly fishing guides and anglers on the Missouri River throughout the month. Excellent dry fly fishing with BWOs, midges, caddis, and march browns. Nymphing will be as good as ever. Dates are starting to book fast. Fly fishing options include: Missouri River, Madison River, Paradise Valley Spring Creeks, and pre-runoff Yellowstone River, Jefferson River, Boulder River, Stillwater River. As good as fly fishing gets in Montana. Our senior Montana fly fishing guides’ calendars are booking fast. PMDs and Caddis hatching on the Missouri River daily. Salmonflies will start to go on the Madison River by the end of the month. Depending on flows, elsewhere too. Some of the best dry fly fishing of the year for truly trophy trout. Book your dates today. Fly fishing options include: Missouri River, Madison River, Paradise Valley Spring Creeks, Dearborn River, and post-runoff Yellowstone River, Boulder River, Stillwater River, Gallatin River, and Jefferson River. Primetime fly fishing season in Bozeman, Montana. Our freestone rivers are running cold and clear, hatches are thick, and wild trout are on the feed. Early summer hatches of stoneflies on the Yellowstone River and Madison River makes for some of the best dry fly fishing of the year for our Bozeman fly fishing guides and anglers. Mid-summer mayflies and caddis followed by late-summer hoppers keep trout and anglers happy the rest of the way through. No bad time to come. And lots of blue ribbon options. Fly fishing options include: Yellowstone River, Madison River, Missouri River, Boulder River, Stillwater River, Yellowstone National Park, Paradise Valley Spring Creeks, Jefferson River, and the Gallatin River. October has always been the favorite of long-time Montana fly fishing anglers and our guides. 2019 will be no different and dates have already started to fill. The crowds are gone and fishing is great. Fall hatches of BWOs, caddis, midges, and terrestrials keep the fish looking up. Dry fly fishing, nymphing, and streamer fishing are all great. The Missouri River offers some of the best fly fishing of the year. The big brown trout of our rivers closer to Bozeman, Montana go on the feed. Fly fishing options include: Missouri River, Yellowstone River, Madison River, Yellowstone National Park, Paradise Valley Spring Creeks, Gallatin River, Jefferson River, and the Stillwater River. Very quiet on our blue ribbon rivers. Many anglers have called it quits for the year. Our Montana fly fishing guides carry on. Most late-season Montana fly fishing trips are booked just days before when we can better guess what the weather is doing. Options can be limited. We like the Missouri River, Madison River, and Paradise Valley Spring Creeks. But are always up for anything. Ready to book or have questions? Contact us and we will get you squared away. Whether you have a day, a week, or a month to fly fish in Montana we can work with you to build your ultimate Montana fly fishing adventure. Here’s to a great 2018 and looking forward to a great 2019.